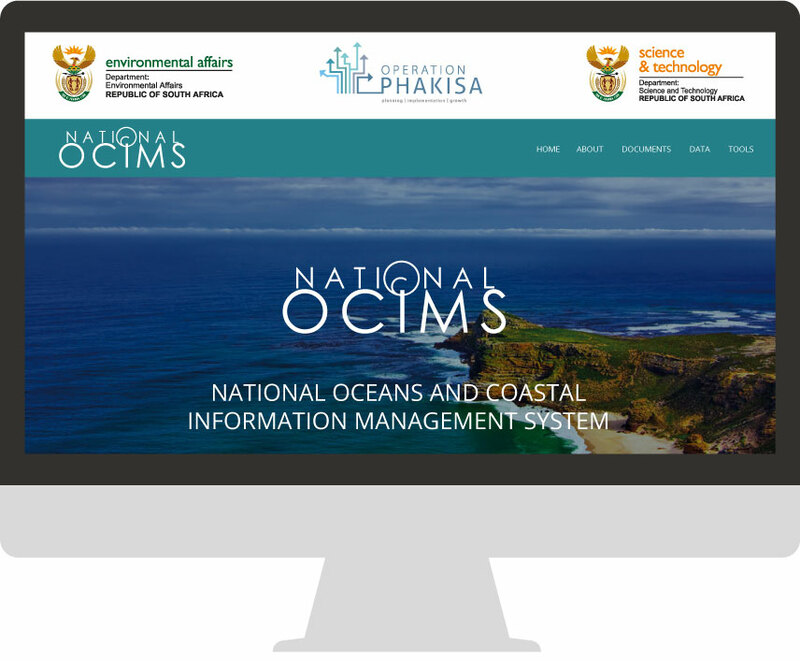 The Department of Environmental Affairs (DEA) and the Department of Science and Technology (DST) have initiated the development of the National Oceans and Coastal Information Management System (OCIMS) for South Africa – referred to as the OCIMS project. The OCIMS project forms part of the Operation Phakisa Marine Protection Services and Oceans Governance workstream Initiative 6: “National Ocean and Coastal Information System and Extending Earth Observation Capability” action plan that is endorsed by Cabinet. Operation Phakisa focuses on unlocking the economic potential of South Africa’s oceans. OCIMS will support a variety of oceans and coastal initiatives by providing information and decision support to key stakeholders for the day-to-day management of South Africa’s oceans and coasts. Establish and implement the data and earth observation infrastructure. The project outcomes will be achieved through the development of an Information Management System (IMS) that will integrate current and future oceans and coastal systems, information and expertise into a user-friendly and cost-effective IMS for the benefit of relevant stakeholders. In June 2015, the Council for Science and Industrial Research (CSIR) was nominated by DEA as a service provider to facilitate the implementation of the project and to co-develop OCIMS. Develop a locally relevant and globally cognisant technological solution that supports the ecological conservation and economic potential of South Africa’s oceans and coasts through information and decision-support for effective governance. In South Africa, 30% of the population stay within 60 km of our oceans. Many coastal communities are dependent on our oceans and coasts for their livelihood, while others reside there because of the lifestyle and recreational opportunities it offers. OCIMS will support the unlocking of the oceans economy through enhanced oceans and coastal management planning and decision support. This will also include integration of data collection, data processing, data analysis, reporting and alerting to effectively and efficiently identify, monitor and predict events and threats. The OCIMS Core System allows the user access to a variety of oceans and coastal related data, Decision Support Tools, documents and other related systems. OCIMS is currently involved in the development of a number of Decision Support Tools. The OCIMS project will continue to develop additional Decision Support Tools based on priority, maturity of existing tools and according to an agreed technology roadmap.